Earlier this month Nintendo announced a slew of new games and upgrades for Switch and 3DS. Of all the announcements, Super Mario Bros. U Deluxe’s new Toadette character and its fan-inspired spin-offs have received the most attention from fans and the media. Undoubtedly, some of you are asking “what / who is Toadette? And why does it have spin-offs already?” Well, let us take a moment to explain. On the surface, Toadette is simply a new character in the Mario universe – nothing particularly special about that, right? Well. it’s not until one learns about the game’s all-new ‘Super Crown’ power-up that things become interesting. See, if you play U Deluxe as Toadette, should you come in contact with said Super Crown power up, something very interesting happens: you’re instantly transformed into a Toadette / Princess Peach hybrid character dubbed Peachette. And while the concept behind the new power-up is fairly novel (by Mario universe standards), what happened when fans on social media caught wind of Super Crown can only be described as… bizarre. 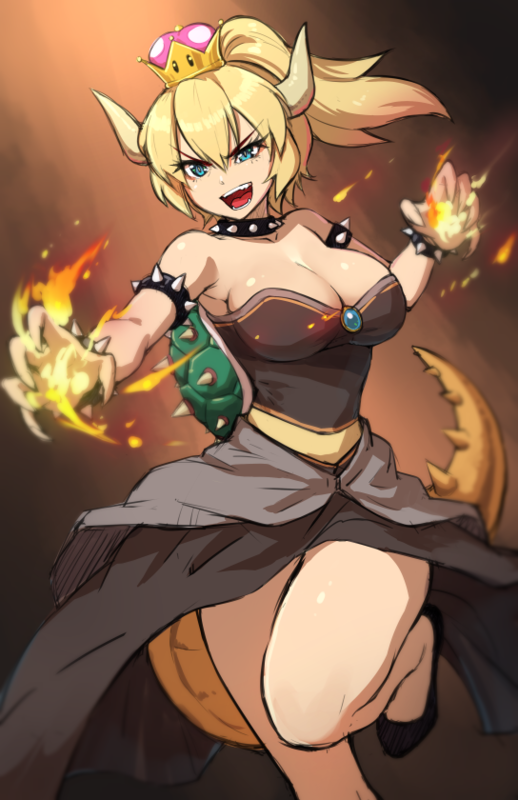 Instantly, outlandish hybrids like Waluigette and Booette started popping up, but Bowsette is without a doubt the most talked about creation. Perhaps as you can deduce from the name, this fan-made character is a Bowser / Peach hybrid. The morph can best be described as a hypersexualized, two-horned Peach wearing black apparel and spikes. And what’s more, she (or is it he?!?) retains Bowser’s shell and tail too! We know – it sounds pretty weird, right? Well, it is! Adding to the bizarre nature of the fan-made artwork is the fact that’s so captivating. And as many have pointed out, although Bowsette looks like Princess Peach, deep within still lurks the monstrous Bowser, arguably the ugliest, most loathe character in the Mario universe. Since the original Bowsette image was first tweeted, dozens of talented fans have recreated the fictional character using their own artistic techniques, including this menacing animation.